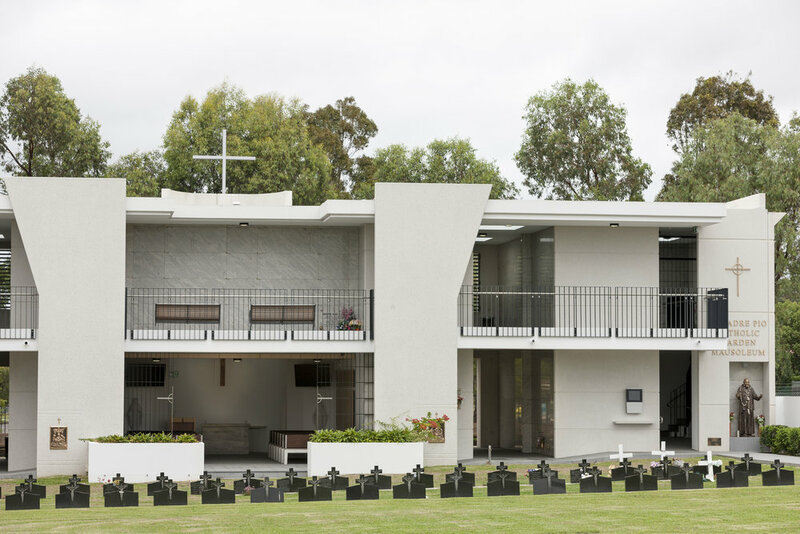 The design of two new necropolis buildings for Rookwood and Liverpool Cemeteries in Sydney was guided by the principle of creating a peaceful and supportive environment for those who are grieving, or simply seeking a place for quiet reflection. While modern in approach, the design reflects and respects the historic, heritage-listed surrounds. The Catholic Cemeteries Board first engaged Ignite Architects in 2009 to design a new Garden Mausoleum at Liverpool Cemetery. 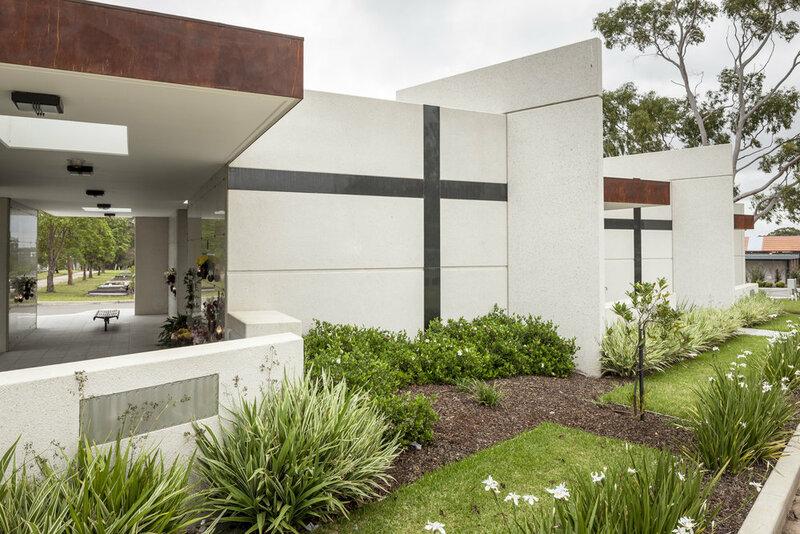 Following the project’s successful completion, they were then commissioned to design the Crypts at Rookwood Cemetery as well. This two level Garden Mausoleum is the first of its kind in Liverpool Cemetery. The site was in a corner of the Cemetery and was designed to house 1,500 places for above-ground burial. A small chapel was also integrated into the design. The chapel is open to the memorial gardens, within the L-shape of the building, and is used for special services and ceremonies. As the Cemetery is heritage-listed, a specialist heritage consultant was consulted in the design process. An archaeologist was also consulted during the construction phase to advise on artefacts and remains uncovered during construction. Over the course of this project, the design team mastered the significant technical issues inherent in this type of building. This provided them with a specialist knowledge, which has been applied to subsequent projects. Sensitivity was critical in the design, particularly as the site frontages were a suburban street on one side and a residential housing boundary on another. Stage 1 of this development was completed in 2011. Ignite Architects was then engaged to design a series of single level Garden Crypts – the St Antonio Crypts – at the heritage-listed Rookwood Cemetery. Rookwood is the world's largest Victorian era cemetery, and the final resting place of more than a million people. The Crypts are located in its Catholic section. The project again included the involvement of a specialist heritage consultant and archaeologist. Stage 3 of these Crypts is currently under construction and will bring the overall capacity of the building to some 850 places. Both the Liverpool and Rookwood buildings reference the materials of the long-established two level mausoleum in the Catholic area of Rookwood. 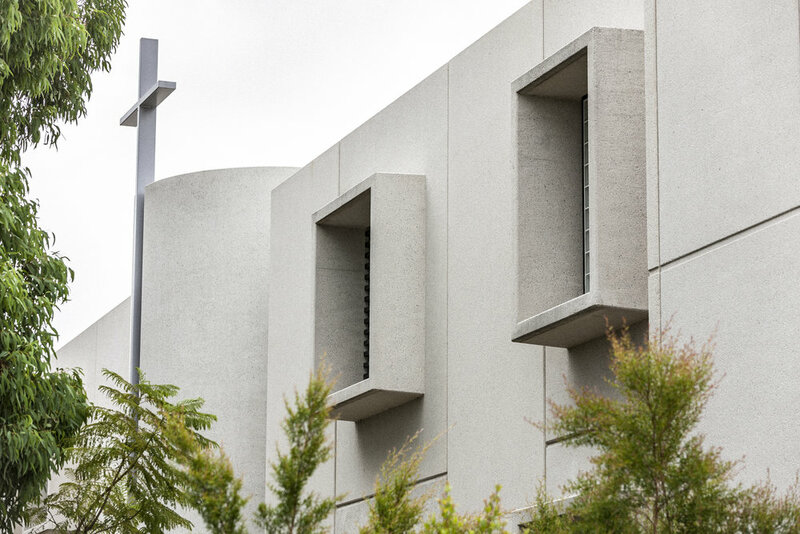 They make extensive use of extremely high quality polished and honed precast concrete panels, which invests the buildings with a sense of permanence and gravitas. The St Antonio Crypts development is based on a repetitive linear form of solid and void, designed to give a sense of enclosure and intimacy within the building forms, but with clear and direct connection to the outside. This has created sanctuary without isolation. The design team was subsequently integrally involved in the detailed master planning for the future of Rookwood Cemetery and the development of a new cemetery in Campbelltown, Sydney. They were also commissioned to design a memorial to the founder of St Vincent de Paul in Australia – Charles O’Neill – at Rookwood Cemetery, which was officially opened in 2015.